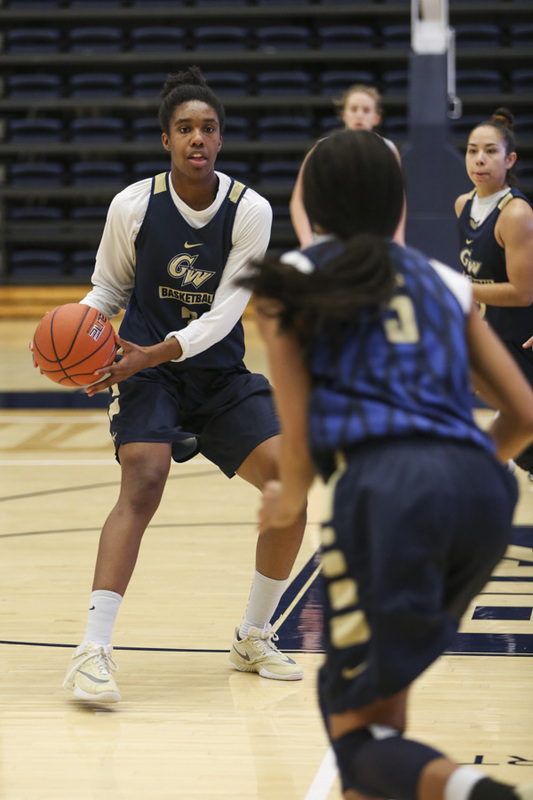 After missing the previous four games with a wrist injury, star forward Caira Washington returned to the Colonials’ starting lineup Wednesday afternoon in style. The senior didn’t miss a step in her first game back, erupting for a season-high 21 points on 9-for-13 shooting, a career-high six assists and recorded her 1,000th career rebound to fuel women’s basketball’s 63-46 Field Trip Day victory over Fordham at the Smith Center. With Wednesday’s milestone, Washington became just the second player in program history with 1,000 points and 1,0000 rebounds as a Colonial. Graduate student forward Lexi Martins – who achieved the same feat earlier this year in her fourth collegiate season but first at GW – followed closely with 20 points and eight rebounds in the first game the duo has started together this season. The win against the Rams (15-9, 6-4 A-10) – who entered the contest boasting the top scoring defense in the Atlantic 10 – breaks a two-game losing skid for GW (14-8, 7-3 A-10). After struggling from the outside the past few games – and going 0-for-8 from three-point range on Wednesday – Rizzotti was pleased with her team’s ability to work harder for layups and get good positioning inside. Despite the rough clip from deep, GW finished shooting 44.1 percent from the field to the Rams’ 38.6 and outscored the visitors 38-18 in the paint. The Colonials fell behind early and trailed 26-22 at the break, outshot by a strong Fordham offense led by junior forward G’mrice Davis who had a half-high 10 points. The A-10’s leading rebounder, also gave GW – one of the league’s best rebounding teams – a run for their money on the glass. Davis finished the day with a game-high 14 boards, however, GW prevailed 35-28 overall. The Colonials turned things around in the third quarter, outscoring the Rams 25-12 on 64.3 percent shooting from the field during the penultimate period. Washington led the quarter with nine points, as Martins guided GW in the second half with 14 points – and senior guard Hannah Schaible added seven -across the final two quarters. Thirteen second-half turnovers by Fordham to GW’s one also helped seal the deal in the 17-point win. With Washington – who said she’s still working on getting 100 percent health – back in the mix, the Colonials look to carry their momentum into Saturday when they travel to Philadelphia, Pa. to take on La Salle at 1 p.m.
Agam Mittal and Barbara Alberts contributed reporting.